I'm sorry for the short, and generally lazy posts. Things have been a little overwhelming around here lately, between clients, packing, re-painting, etc. I've been elsewhere in body and mind. So, I'll probably just be posting little blurbs, inspirations, and finds for the next couple of weeks. Although, I'll try and have at least a couple of decent posts mixed in there too. 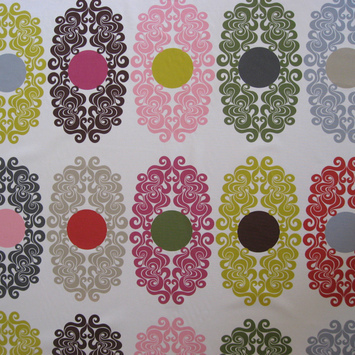 Today though, I am loving this large scale, special edition fabric by Mod Green Pod. It's super fun and colorful. 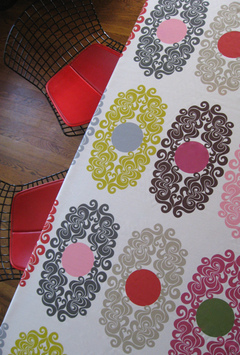 It is an upholstery weight fabric, which means, it could make a chair, or even a couch very happy. Different, but in a good way. Right? I love it. Great mix of colors. I really love this! I think it would look great on a traditional looking chair!